Cristi Cuellar. Las Vegas, NV. Recently relocated to Pharr, Tx. I competed in fitness/ bikini competitions without knowing anything on how to train. I saw a fellow competitior look drastically different from one competition to another. She told me Andre was her secret! My goals were to take on a new and more challenging workout and diet that would become part of my lifestyle and make me look better than ever. YES. He did. Now after competing, i still strive to work out as hard as Andre taught, and I still want to eat and supplement the way Andre advised. I did not get the same workout every single week. It did not get boring, and Andre really did want to know how I was doing more often that i thought he wanted to check in. He was always there for me even though we did not train in the same city. I was always on my toes, because i knew I had a mini-Andre sitting on my shoulder!! Andre's requirements and updates were very motivating. I did not feel good disappointing him- he expected high performance, all the time, but when i did slip, he was there to pick me up and keep going. He was so positive, and he had very motivating words, as he saw the true potential in me. My strength, my look, and my knowledge. My upper body is so strong now. I can lift more at work, and my posture is better. I thought inreasing the frequency and intensity of upper body workouts would not make me look good, but i love the way i look now!! The diet has also trained me to eat healthy year round. It has become a habit and way of life and i am proud of it. Now that i have so much more knowledge of diet and exercise, i can share it with others and hopefully change the people around me to become happier with themselves as well. "What? Online?! No way," is what people told me. Trust me. It worked. Andre teached me what to do, but it was up to me to do it. He provided the plan, but i had to have the drive to carry it out. I liked that. He was always a phone call away, and i felt ver comfortable sending him results and feelings about them. I trusted him. Post competition, or photoshoot, i have the confidence in knowing i still have my own drive to work out.....but i know that i can trust Andre to form a new workout based on new goals, because he always has room to kick it up a notch! Bikini America - Mexico. 1st place- Ms Bikini Mexico Internacional Elite! 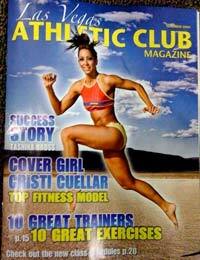 Las Vegas Athletic Club Photo shoot (a week later) I landed the cover! !